4 PACK packaged, 2016 newest upgrade 360° rotate + 30° sway adjustabe, maximize your view with wide angle in car. 2" HD Glass curved male face frameless ultrathin slim design, equip with 3M adhesive for pressure-sensitive tape installation. Built-in rupture membrane, 3 times metal plating mirror surface for more clearly, stiffness and durable. Integral moulding, grinding processing for the edge, 100% weatherproof. Will not crack or rust like others mirror. Stick and test within seconds, 2 for your rearview mirror, 1 for your inside rear-view mirror, 1 for standby. All universal vehicles car fit accessory, MUST have for every truck, car, SUV, motorcycle, RVs and vans. 4 x blind spots mirror and support. 3M stick-on for every mirrior. No reason for return or change. Are you annoying about the blind spots in driving? Are you worried about the accident in backing car? Do you know crashes due to blind spots are on the rise by 48%? 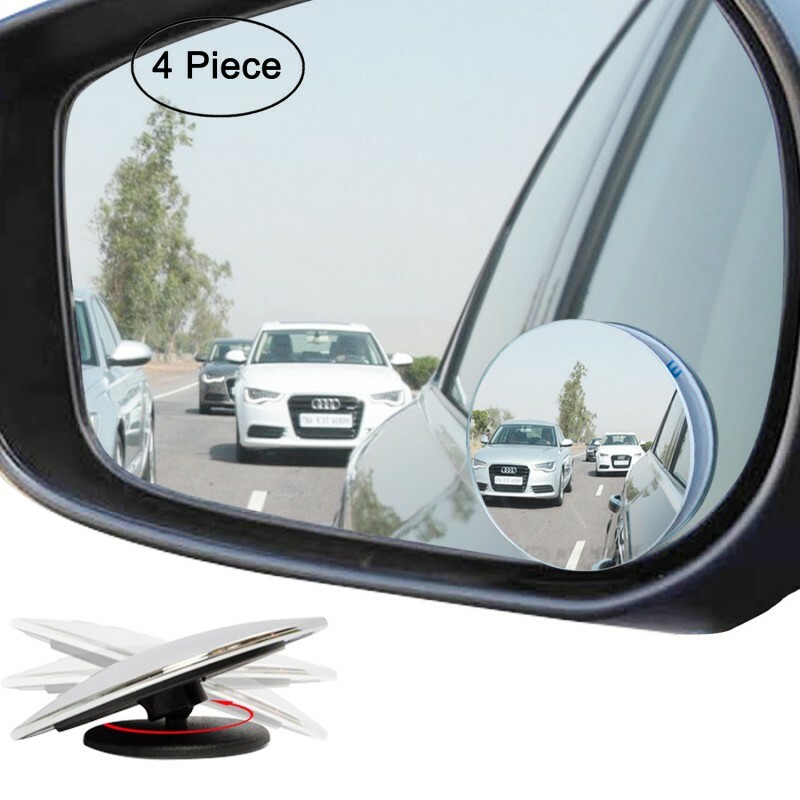 You need this MUST have blind spots mirror to KEEP YOUR DRIVING IN SAFETY. 1, 2" curved male face frameless ultrathin slim mirror. 2, 4 packaged rather than 2 like most, 2 for your rearview mirror, 1 for your inside rear-view mirror, 1 for standby. 3, 3 times metal plating mirror surface for more clearly, stiffness and durable. 4, Rupture membrane within the item. 5, Integral moulding, grinding processing for the edge. 6, Strong 3M stick-on for solid stick. 7, Will not crack or rust like others mirror. 2, Clearly when you backing your car. I just received these blind spot mirrors (ordered from Amazon) and put two on my motorcycle. Absolutely perfect. Now there are NO blind spots and they even adjust left/right/up/down so you get a great view. Easy to put on and may well be a life saver. Copyright © 2016 Ampper All rights reserved.